Get your diet right first! There are an amazing variety of prostate health supplements on the market that claim to help prevent prostate cancer and enlarged prostate, but in many cases their efficacy is debatable. Before dosing yourself up with assorted vitamins and minerals, the first thing is to make sure you have a healthy diet, which may not only lessen your risk of developing prostate cancer but also help to prevent other conditions, such as heart disease. But here's good news for red wine drinkers:. According to a study published in the International Journal of Cancer, August 2004, men who drink more than four glasses of red wine a week were 50 percent less likely to develop prostate cancer. 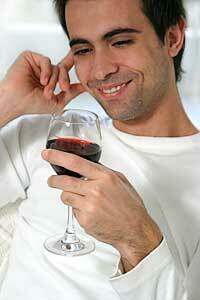 For every glass of red wine drank each week, the risk of developing prostate cancer decreased by six percent! But that's not all, folks! The study showed that the men who drank more than four glasses of wine a week were 60 percent less likely to develop aggressive types of prostate cancer. The researchers think that resveratrol may protect the prostate and be responsible for decreasing the risk of prostate cancer. But it's not all good news, this study also showed that drinking other types of alcohol, such as beer, spirits or white wine, did not reduce the risk of prostate cancer. But on to other health supplements that may reduce the risk of or treat prostate cancer. The commonly suggested prostate health nutrients are selenium, calcium D-glucarate, green tea, broccoli, grape seed, maitake mushroom,lycopene, fish oil, garlic, vitamin D, pomegranate juice, red clover, Quercetin and Zyflamend (but see red wine above!). Learn more on the next page.